This post is the third in a series during the month of December 2016, where we are reflecting on the things — issues, movements, and ideas — that give us a reason for existing here at Interference Archive. Read our first post, on women’s movements, here; our second, on labor movements, is here. The collections at Interference Archive highlight queers as movement organizers and queer struggle as integral to social movements. Posters, zines, and flyers document queers demanding liberation, combating the dominant LGBT assimilationist agenda, creating punk music and performance, and writing queer histories. Interference Archive situates these materials in conversation with movement work including feminism, prison abolition, punk and squatting – demonstrating that that these movements are inseparable, and that our liberation must be collective. QZAP:META No. 4, Queer Zine Archive Project (USA, 2010). 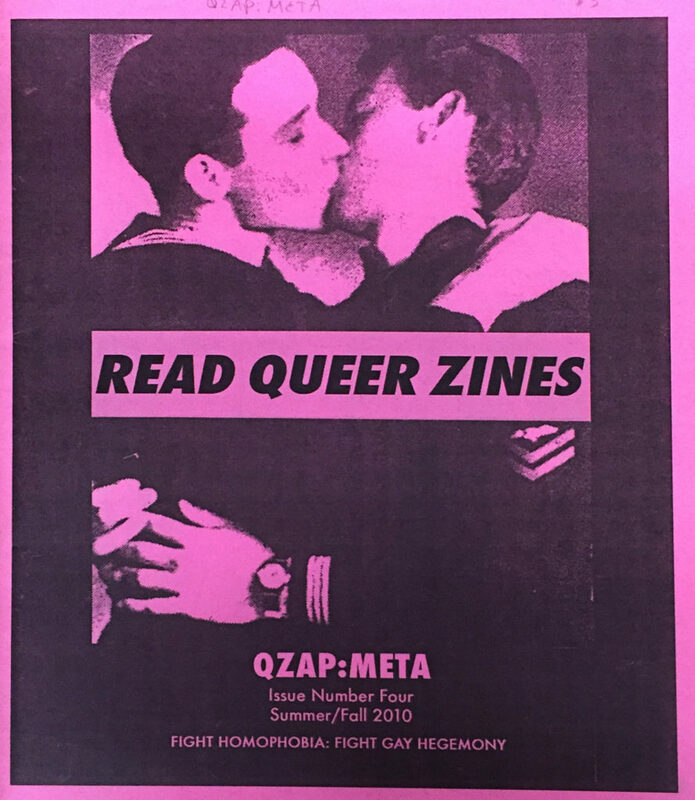 This zine is published by the Queer Zine Archive Project to contextualize their collection, from the stories of individual creators to academic discussions of queer zine culture. You can see this and other queer zines in the mini-exhibit “Queering Interference” (part of We Are What We Archive), which is open until January 15th, 2017.